So the boyfriend and I decided to hit up the mall after work. We went to Glendale Galleria since they have Lush store open there already (can't wait til they open the one at Topanga!) to check out some of their stuff. Anyway, I was looking for a replacement for the gift he got me for my birthday. He originally got me the Bobbi Brown Shimmering Nudes palette and the Harajuku perfume in Love which he bought and had nicely gift wrapped from Nordstrom, but I ended up returning both because: 1) whoever rung him up didn't give him the free gift with a $100 purchase (hey, free is free) and 2) because I realized that I wasn't really too fond of the Bobbi Brown palette because it looked too similar with what I already have (swatches will be up soon) after testing them out. Anyway, although I really love the Harajuku perfume, I had to return for the meantime so when I do find something to replace the palette with, I can get the free gift with purchase (yea yea I know). 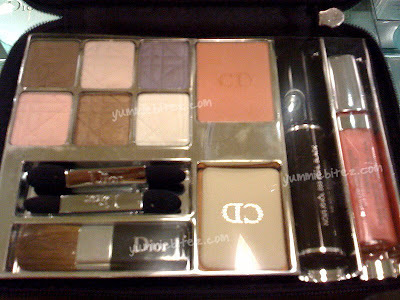 So with a new item I just mentioned on my lemming list, I had to check out the Dior Deluxe Travel Palette. Luckily, the Nordies in Glendale Galleria already had them out with a tester ready for me to play with. Sorry if the product pictures are a bit blurry. I took them with my iPhone. I wasn't about to bust out my camera in public. So did I end up with this baby home??? It wasn't exactly what I pictured it would be. It wasn't as glamorous as it seemed on the photo. Yes, it does have six eyeshadows, a sample of their Blackout mascara and Ultra gloss reflect with a blush and a sun powder (bronzer), but to me it just wasn't worth to shell out a fat $70 on it, well to me at least. The eyeshadows are nothing I haven't seen or extraordinary. They're pretty much your basic OL colors that you can probably find in another for a lower price. I probably wouldn't use the purple and pink colors only because it's most likely not going to show up on my tanned skin and the color also seemed a bit too teeny-bopper-ish maybe because they're pastel colors. Also, the white and the pink shades are just too close of a shade to each other that once I lay it on my eyes, they'll end up looking the same (white). However, I really like the sun powder and the blush that it came with. It just had a nice sheen to it that it'll make your face glow once you put it on. But still not worth $70 for two small blushes. The lipgloss was a nice pink shade with reflects on it. It was a very pretty gloss, but probably something that I'm not really going to use only because I have enough pink gloss as it is. It wasn't really an "ooooh so pretty" color for me. What really irked me the most out of this palette was the casing itself. I was looking at it for awhile and trying to think of what's wrong with it. It looked like a daily planner (fil-o-fax). The leather was just so cheaply made and even worse when you see the lining inside the palette. It's like one of those designer dud wallets (might as well be) that you can find at a swap meet (or maybe downtown L.A) with a Dior logo just slapped on top of it. It was sooo not deluxe, just bulky and ugly. My bf even pointed out that it looks a bit cheesy, and has too much of a Swiss Army knife feel to it (I don't know where he got that, but I do see what he's trying to say). The case just looks like an emergency or first aid kit that you take with you when you go camping. As you can tell, I ended up talking myself out of buying $70 makeup palette. It ended up becoming passable to me once I saw it in person. I thought I was going to get this palette the price was just waaaaaaay too steep for the type of product you're paying for. But I still did get something in lieu of the failed Dior palette. But that's another post :). Hey Anne, what kind of store is Lush and what do they carry? oh gosh i am so glad you did this post. i really wanted it too as well, but since it wasn't up to par to what it says it should be like...hrm...i wouldn't want to slap 70 bux down for a regular palette either. thanks! You know what the case looks like?! Besides a planner... it looks like one of those nail kits. Hahahaha. What a disappointment! The Gaucho palette's packaging is so much better. Plus I think I already have all those e/s colors, from Dior! Haha. I returned my Harajuku perfume as well, no matter how cute it was, I couldn't stand for the plastic-y feel of the doll. i wanna know what you got!!!! 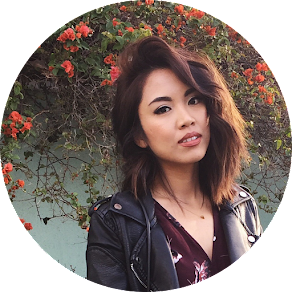 Mimi: Lush is freshly made cosmetic store. They make homemade all natural ingredients soaps, skincare, shampoos, and the like. It's actually a pretty neat store. You can buy soaps or cleansers based on how much you think you'll use (by the lb). Kawaiikao: Yea the palette was just bleh. Really not worth it in my book. Fuz: HAHAHHA I definitely agree with that. I'm just happy I'm not the only one who thinks so. I actually got the perfume again (i'll explain later). I really like it. And it didn't have a plasticky feeling to me in my opinion. I was a bit worried too when I first got it since you did mention that in your post. But it wasn't, well my bottle at least. Ate Ren: I'm gonna have to post it tonight! LOL. Pink: I'm just branching out now. Super slowly. I have enough make up as it is so I have to be particular of what I buy now. But that post of what I got will be in the works for tonight. I don't know why, but I find it funny that you returned the gifts he got you. Hehe. Can't wait to see what you got, though. I still don't know what I want for my b-day. Thanks for posting!! Now I have no lemmings for it, lol, and that's always a good thing! That's a pity. I was actually looking forward to dropping $70 on it haha. But yeah, the eyeshadows aren't that special. Lol. BFs always have this amazing ability to relate it to man stuff. My BF does that when I want to buy new makeup! 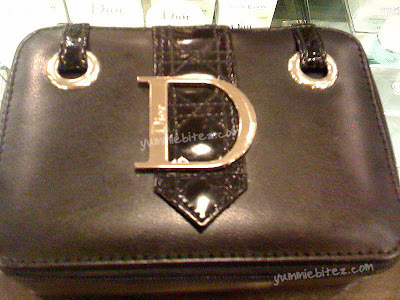 the designer bag to this is cute! i like dior... but soOo expensive lol nice haul & swatches gurl!